Moving up to the inside of the skull, there is the brainstem. The brainstem includes a region called the “oblong core” — medulla oblongata in Latin, or simply, medulla. The medulla controls the most basic functions: heartbeat, respiration, and the like, the so-called “vegetative” functions. The brainstem is nestled deep at the base of the skull, well-protected by bone and muscle, between the mouth and the nape of the neck. Further up, there is an area called the thalamus. The thalamus sorts through sensory information coming in, decides which is most important, and allows the most important information access to higher brain levels. It also sorts motor information coming out. The only sensory pathway that doesn’t go through the thalamus is the sense of smell, which is why it’s so hard to “shut off” the sense of smell. Once someone’s overbearing perfume or the stench of death or a baby’s dirty diaper gets into your nostrils, it’s impossible to ignore. Further, the sense of smell is connected directly to the emotional centers of the brain. Proust’s Remembrance of Lost Times (or Remembrance of Things Past) is a seven-volume masterpiece whose trigger was the smell of tea-cakes baking in a Paris street. It’s hard to imagine any of the other senses evoking thousands of pages of a narrator’s lost past. In human behavior, there is a clear division of brainstem (we’ll include the thalamus, even though it’s a separate area to anatomists) and cortex. All decisions are made at the subconscious level, and the cortex comes along later and plasters a rationale for the decision on top. We believe we use logic and reason to arrive at our behaviors. Almost always — maybe always — it’s the other way around. The brainstem supplies the answer. The cortex supplies the reason. The cortex (“bark”) lies at the top of the brain, both anatomically and metaphorically. Only here are we privy to the actions of nerve cells. If a sensation reaches cortex, it is consciously perceived; if it stays in the brainstem or thalamus, it resides only in the subconscious. 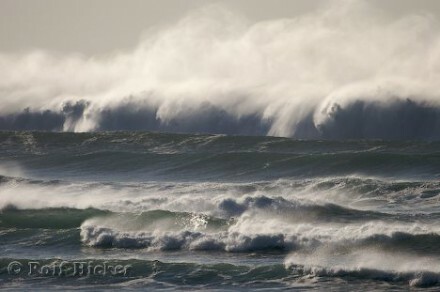 If a motor action is to be carried out by force of will, it begins life as a plan in the cortex. It is then relayed back through the thalamus to finally end up as a signal onto motor neurons, the cells that hook directly to muscle. When the motor neurons are activated, they send a signal that causes contraction of muscle. All that brainpower, and you can only do two things: move a muscle, or change the secretion of a gland. 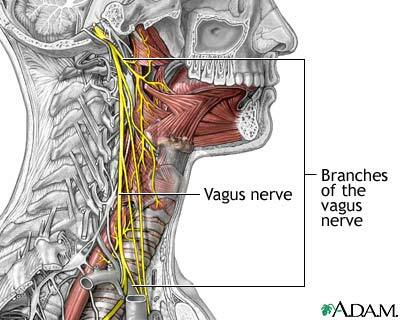 For controlling the function of the head, and for picking up signals coming into it, there are special brain cables called “cranial nerves” that carry information into or out of the central nervous system. There are twelve pairs (left and right) of these; the first one, the olfactory or “smell” nerve, is part of cortex; the second one is part of the thalamus; and the remaining ten are associated with the brainstem. For example, numbers seven, nine and ten carry taste information into the brainstem. Think of the medulla as the stems of a large floral bouquet. Traveling up the stems, we find the brainstem, of which the medulla is just a part, and then we encounter the base of each blossom: the thalamus, which serves as an intermediary between the stems below with their vegetative functions and the blossoms above. At the molecular level, the nerve cells (neurons) of the brain work by releasing chemicals from tiny apparatuses found at the end of a branched nerve cable. The pair of chemical-releasing neuron ends and chemical-receiving neuron platforms are together called a “synapse”. The chemicals are known as neurotransmitters, because they transmit signals between neurons at synapses, but there is actually plenty of overlap between other kinds of signaling molecules — neurotransmitters, hormones, and even some food molecules all share similar mechanisms. As we’ll see later, some molecules found in food act as neurotransmitters or hormones. The only real difference between a neurotransmitter and hormone is the distance the signal travels to get to its target. The target of a neurotransmitter is another nerve cell, or a muscle cell. These cells contain receptors, a protein molecule which floats in the receptive part of the neuron or muscle cell like an iceberg. The neurotransmitter molecule has a shape, with areas that carry positive and negative charges. The exposed part of the iceberg has a pocket that, like a jigsaw puzzle, matches the shape and complements the charge of a neurotransmitter. When the neurotransmitter nestles in its pocket, the iceberg changes shape and grinds into action: opening a portal, or closing one, or kick-starting a chemical reaction. As I pursued an education, I became convinced that Mom was dead wrong. The fashion of the time in my psychology classes was to ignore the influence of genetics and to ascribe every feeling to a learned behavior, no different than programming a pigeon to peck on a spot for his food. The glutton was not the victim of hormones, but somehow a loser in the willpower Olympics. He just wasn’t trying hard enough. Now, I see Mom’s point. As much as it pains me, she may have been right, but perhaps not as she intended. It’s not an either-or choice between hormones and behavior. Rather, these two are intertwined, inseparable, mutually interdependent. Hormones are shaped by behavior and genetics; behavior and genetics shape hormones. Hormones are the name we give chemicals which signal between body parts, including between the brain and digestive system. All the parts of the digestive system named above have a message to send the brain. 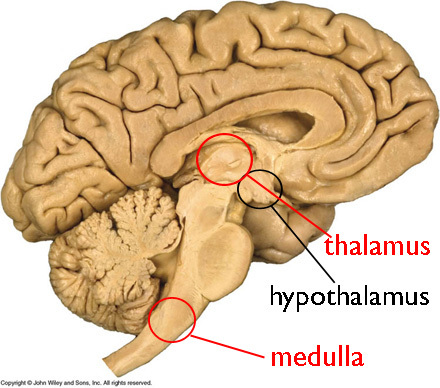 The messages, in turn, are received and processed by all three levels of the brain: the medulla; the hypothalamus (sister and conjoined twin of the thalamus, lying just below the thalamus); and the cortex. The medulla receives taste information from the three nerves that carry it. The medulla contains a cluster of nerve cells which receive taste information, called the solitary nucleus because of its characteristic bullseye appearance. In three dimensions, it’s shaped like a corndog with the nerve cells as the wiener and their incoming and outgoing axon cables as the breading. 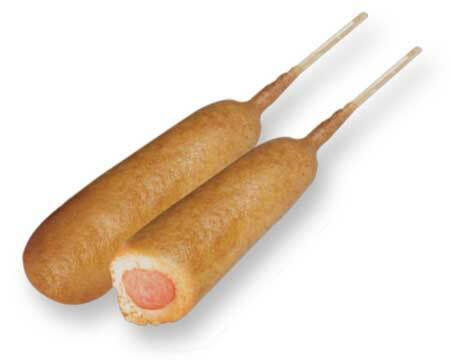 If you slice through the corndog, you see a circle of solitary wiener surrounded by a wall of breading. To study the medulla, we slice it, stain it, and look at it under the microscope. Everything else in the medulla is all jumbled together, but the wiener and its breading stand alone. 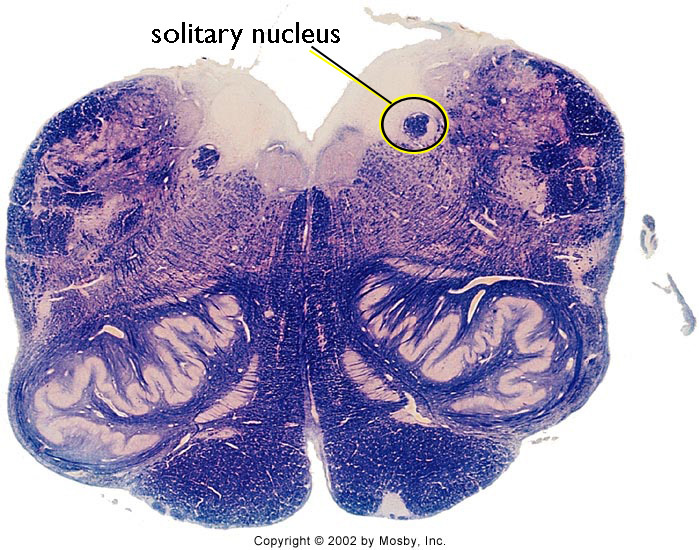 Leading from the solitary nucleus, taste information is passed through nerve “wires” (axons) to the thalamus and hypothalamus, and from there up to the area of cortex responsible for that part of our sensory world. The medulla, where taste information is processed, also receives signals from the stomach. A hormone called ghrelin is released from the stomach when you’re hungry. It gets its name both from being a growth hormone releasing (GHR) peptide — a peptide is a smallish protein — and from the Indo-European root word ghre, which means grow. I like to think of it as a Gee, Hungry, Really Eat Like Now peptide. Earlier, we described the effects of eating a single milk-sodden Oreo. If you eat an entire package of Oreos instead, the stomach wall stretches and sends that signal to the medulla as well. A third hormone, leptin, is the yin to ghrelin’s yang. Leptin signals the medulla that the stomach is full and that eating can stop, a response scientists call satiety. 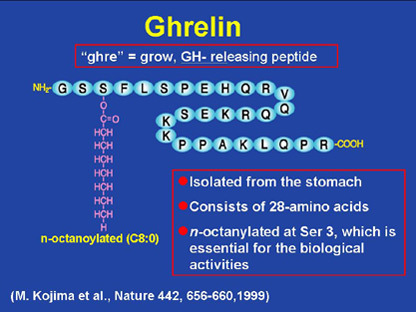 Ghrelin is a recent discovery, identified by a Japanese group about ten years ago. In the hypothalamus, ghrelin sends a signal to the nearby pituitary to release growth hormone, ensuring that your teenaged body reaches its full height. Remember that these peptide hormones can and do act in different places, and have different functions. It’s as though the same stock parts were chosen to carry out different functions in different machines. In the appetite system, cells lining the stomach release ghrelin, and ghrelin receptors are found in one of the twelve cranial nerves — number ten, the vagus, which not only carries taste information back to the medulla but also carries sensory fibers from, and motor fibers to, the stomach and other internal organs. Ghrelin levels are increased by a lack of sleep, which may be one reason lack of sleep may help make us fat. As appetite-stimulating ghrelin is made, a by-product of its production is another hormone called obestatin, which acts to suppress appetite. It’s not the only, or even the main, appetite-suppressing hormone. Ghrelin signals, “let’s eat” — the yang of the stomach’s appetite signals, screaming its call to action. Its yin, calming and relaxing the appetite system, is leptin. Leptin says, “that’s enough; let’s rest for a while.” Like any peptide signal, leptin has a receptor. Leptin was discovered some time ago. There is also good evidence that the contents of our gut have a huge influence on how we digest things, and even how hungry we are. The human body has 100 trillion cells, but only 10 trillion of those are human cells. Ninety percent of our bodies are microbial travelers, and the skin surface plus the inside of the gut make up the bulk of that 90%. For example, once water is removed, feces is one-third bacteria by weight, almost 1 trillion bacteria leaving every day to be replaced by their reproducing friends back in the warm, moist confines of the gut. As explained by Carl Zimmer in a recent blog post, there may be different “microbial types”: some people have a predominance of one type of bacterial life in their gut, while others have a different set of “enterotypes“. This would be of interest only to microbiologists except for two things. 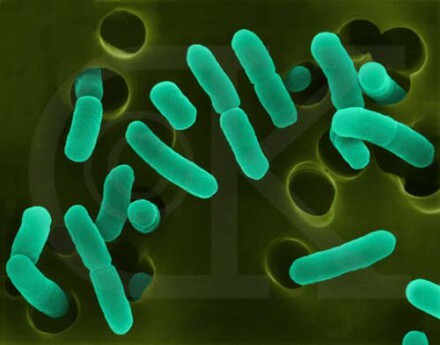 First, these gut bacteria may alter the way we digest food, with different groups extracting more or less energy from our food and thereby predisposing us to be fat or thin even if we consume a set amount of calories. Second, these gut bacteria may even change our behavior, tweaking the hormonal system so we feel more or less full. Two people with different gut biomes may eat the same amount of food, and one will still feel hungry while the other feels overstuffed. Edit: Laura Mariani has blogged about the effects of ghrelin on the olfactory (smell) system. An excellent read. 4 Comments so far. Leave a comment below. I’ll be back again, Jim, with more thoughts, but meantime a question: can you make your posts shareable on FB and by e-mail as well as Tweetable? I’d like to connect some people I think would be interested, and those would be the best ways. Otherwise I guess I could stop being lazy and use a link! I will have to figure out which WordPress plugin will do that most effectively. It’s a good suggestion. In the meantime, I will post it over at FB and you can send it along with the “share” button. 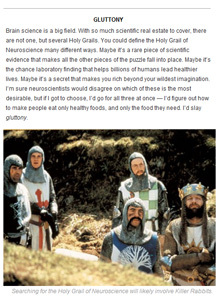 You take tremendous care to make neuroscience understandable to everyone. So why do you have to put the title of Proust’s work in French? OK, Rosie, I fixed that.